The ADG3249 is a 2.5 V or 3.3 V, high performance 2:1 multiplexer/demultiplexer bus Switch It is designed on a low voltage CMOS process, which provides low power dissipation yet gives high switching speed and very low on resistance. This allows the input to be connected to the output without additional propagation delay or generating additional ground bounce noise. 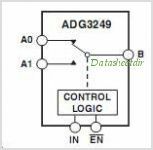 Each Switch of the ADG3249 conducts equally well in both directions when on. The ADG3249 exhibits break-before-make switching action, preventing momentary shorting when switching channels. This device is ideal for applications requiring level translation. When operated from a 3.3 V supply, level translation from 3.3 V inputs to 2.5 V outputs is allowed. Similarly, if the device is operated from 2.5 V supply and 2.5 V inputs are applied, the device will translate the outputs to 1.8 V. In addition, a level translating pin () is included. When is low, VCC is reduced internally, allowing for level translating between 3.3 V inputs and 1.8 V outputs. The AD3249 is available in a tiny 8-lead SOT-23 package. This is one package pinout of ADG3249,If you need more pinouts please download ADG3249's pdf datasheet. ADG3249 circuits will be updated soon..., now you can download the pdf datasheet to check the circuits!